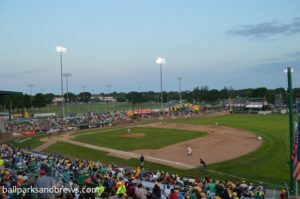 Ballpark Basics: Making baseball fun again! Walking into Warner Park is like walking into an amusement park. You enter in the left field corner of the park and are inundated with a ton of activities including a playground, moon bounce, sandbox and even a zip line. It can be almost overwhelming as you first enter and try to get your bearings straight. 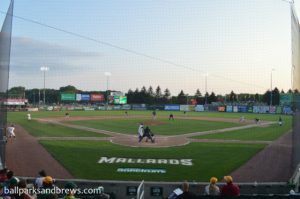 The Mallards must be one of the most popular events in town because it was wall-to-wall people no matter where you went in the ballpark. Luckily there are a ton of seating options for individuals and groups alike. 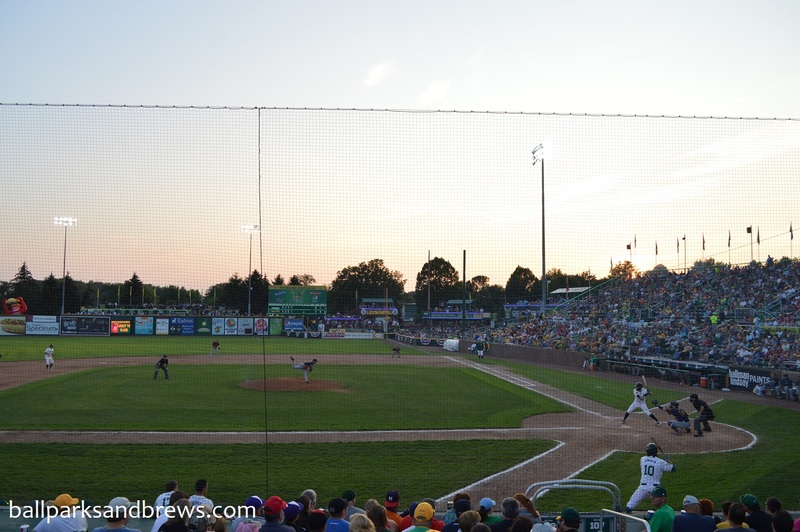 The Duck Blind and Duck Blind Suites & Club take up the right field while a picnic area and suites are in the left field along with the Backyard seating area (bonus points for one dollar from each seat in this section going to the local Boys & Girls Club). Also, there is a ton of helpful staff around (with just the right amount of mid-western charm) to point you in the right direction. Best Spot For Beer: There are too many options to choose from! There are so many options that the team has included a beer map on their website. There are beer stands spread out throughout the park (some dedicated to just craft beer). 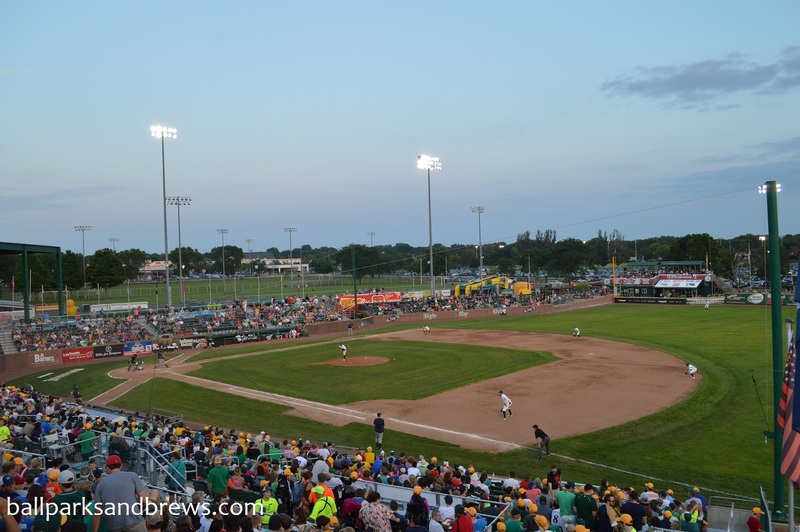 The most accessible stand with plenty of options is the main beer stand behind home plate. Here you will find over twenty options to drink with many local choices. 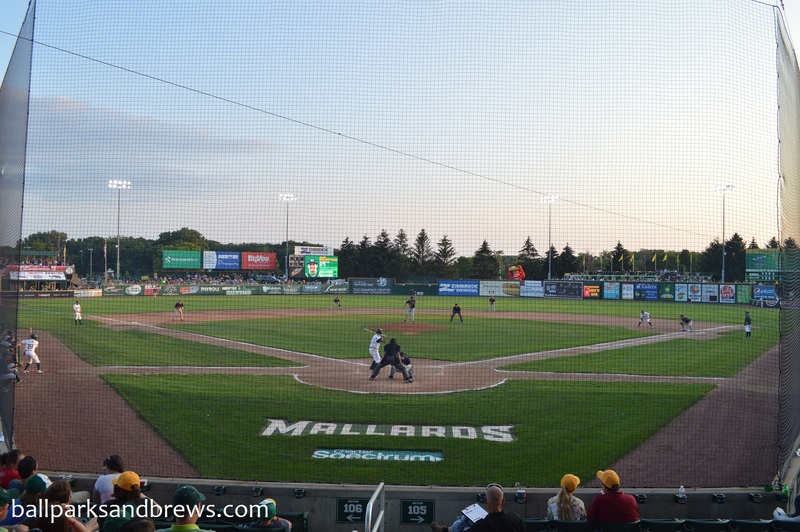 The Mallards have also partnered with Great Dane Brewing for their own pilsner available at the Duck Pond. On top of that, they also have designated “beer batter” from the opposing team. If that batter happens to strike out the crowd is able to get 2 for 1 beers for the following inning. It’s safe to say that this particular batter had a rough night each time he came up to the plate that night. 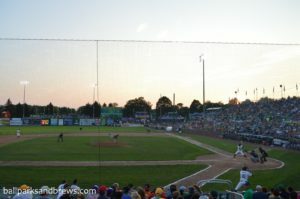 The Mallards have created quite an environment at Warner Park. While many purists might balk at all the activities that surround the game we had a blast (and it seems like almost everyone else did as well). From the moment you enter until the very last out you are bound to be entertained while at the Duck Pond. 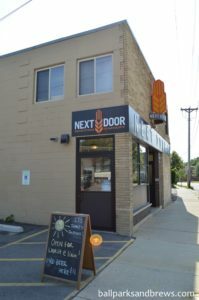 And now, a “twofer”…like many cities these days, Madison had many brewery options to choose from. This time, we decided to highlight a smaller local favorite and a larger popular destination spot. Read on! 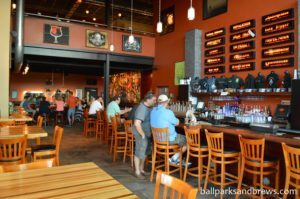 Beer Basics: The friendly, local spot. Next Door was dark and cool on the bright, hot summer day we visited. 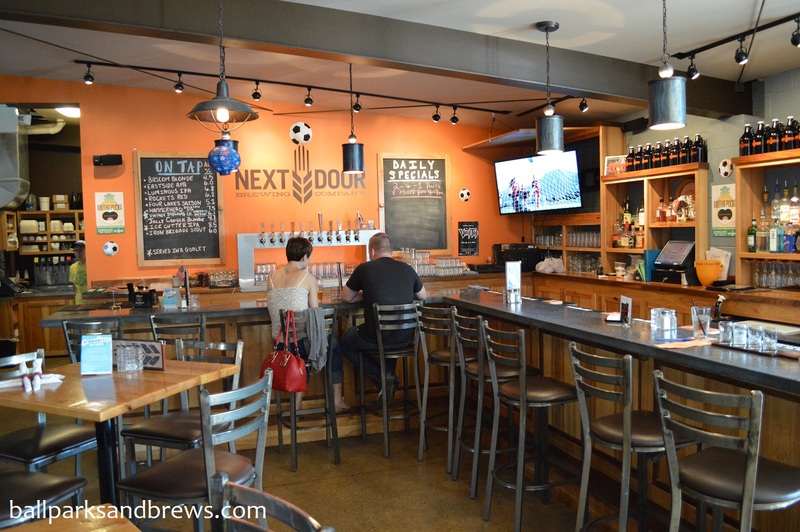 It’s a cute little spot where only couple of tables and a bar that takes up most of the taproom. The decor is contemporary and fun with fun orange accents. The bar is L shaped, and immediately to your right when you walk in. Stools line the whole length and the bar back is divided in two; behind half of the L are the taps and glassware, along with chalkboards that are updated with current fare. The other half of the L is where the swag shop is, selling all of the usual suspects, from t-shirt and pint glasses to growlers. The staff was great, working hard the whole time but willing to answer any questions or provide advice along the way. There when we needed them, but not on top of us while we were trying to review. While reviewing baseball and beer is a great side job, some days it really feels like work. Usually it has to do with scheduling (and we were on a tight timeline), but in this case Next Door was having a buy one/get one pint deal, and we were tempted to go big. However, we decided accurate reporting and not drinking and driving was better than saving some money so you’ll see we forwent bogo pints and sampled the house for you. There was no flight per se, but you could get any beer in sampler size for 2 bucks a pop. Four Lakes Saison 5.1 abv/ 20 ibu – A very earthy, lemony aroma with some strong Vienna malts. Light gold color, visible carbonation and white lacing. The Saison has lots of flavor which is alternately hoppy and floral with a dry finish. Rocket’s Red 6.2 abv/ 50 ibu – Maple syrup in color with fast moving bubbles and lots of creamy, off white head (why does describing food always sound so dirty?). The aroma is malted and slightly citrus and the flavor is piney with an almost curry-like pop at the end. Hammerhead 7.5 abv/ 80 ibu – The Hammerhead has a deep copper brown color and spicy aroma. Lots of hops that pop up at different times as you drink. And though it’s hoppy throughout it ends with a slight non-citrusy fruit notes. Iron Brigade Stout 6.0 abv/ 52 ibu – Dark, dark chocolate in color and like all the others here, lots of lacing. A strong malted bouquet, and the taste follows through with a blend of coffee and chocolate malts which end on a smoky note. A very good beer that according to the bartender is named for a Civil War era brigade that was mostly made up of volunteers from Wisconsin. 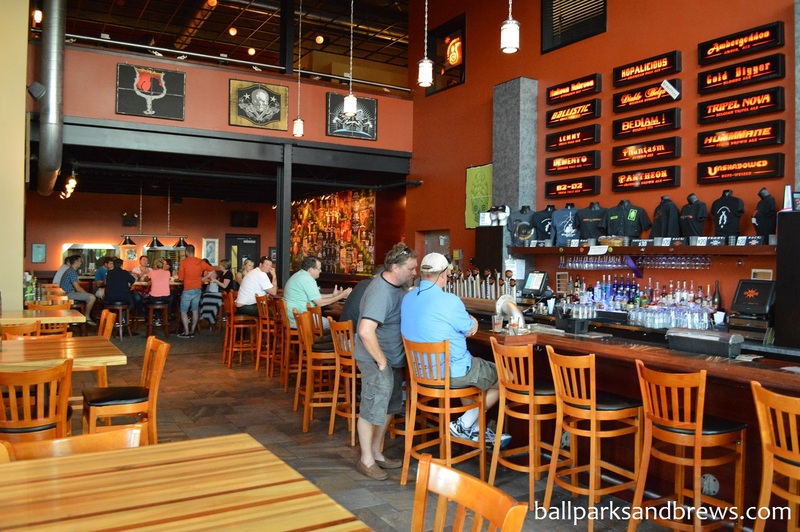 Beer Basics: The hot spot with multiple locations (kind of). 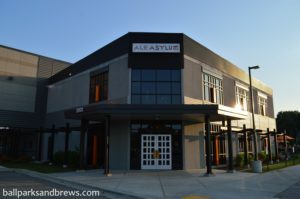 Ale Asylum reminded us a lot of a brewery that’s more centrally located to us, DuClaw. It’s kind of “scary”, as in creepy sort of beer names and edgy fonts. Lots of hammered metal, brown walls, black decor. The one in Madison is a huge building whose size is only really revealed as you weave your way to the bathroom. 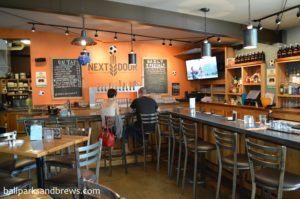 Interestingly we thought this brewery had multiple locations, but that’s only sort of true. While there is another Ale Asylum – Ale Asylum Riverhouse is located in nearby Milwaukee, and though they share the same beer and logos, they are actually not affiliated. Riverhouse has been open for five years longer than this Madison location, and from what we gathered this one was opened by one of the original owners, who now wished to remain independent. Tripel Nova (9.8% ABV) Belgian Tripel beer that is very sweet. You get the belgian yeast upfront and just a bit of sour at the end.. Visible carbonation, bright yellow color and a little bit of banana in the nose. While the beer does mellow through the sip, it remains quite sweet throughout. Phantasm (7.8% ABV) An autumn ale with a hoppy smell. The taste is also hoppy and spiced. Visible carbonation and foamy lacing top this copper-kettle colored beer. Ambergeddon (6.7% ABV) This is an amber, and smells hoppy like the autumn Phantasm, but the palate is acutally smooth with caramel character, malted flavor and a lightly sweet almond finish. Our favorite up to this point. Hummane (6% ABV) – An India brown ale that is truly brown with off white lacing. The smell is alternatively hoppy and malted with a little hint of chocolate notes. Though the flavors compete, they end up balancing to be a first hoppy, then nutty ale. B2D2 (6.3% ABV) – a test batch, “never to be bottled” but like all beers in their pilot batch series, you can go online and tell them what you think. This was the lightest color beer we had that day, but still had a dark gold color. Hop forward aroma gives way to pear, then a hop like finish. Pantheon – Cherry Coke color that smells dark and tastes smooth. Served warmer than the others, which helped to bring out the brown sugar and caramel upfront and then imperial notes and a dark currant flavored body.